Back in the day, one of the key Republican arguments against the estate tax was that it forced hardworking, salt-of-the-earth children of small farmers to sell the family plot in order to pay their taxes after dad died. It was a sad story, but with one problem: no one could find even a single small farmer who had been forced to liquidate in order to satisfy Uncle Sam’s voracious maw. Even the American Farm Bureau Federation was eventually forced to admit that it couldn’t come up with a single example, and a few years later the Congressional Budget Office estimated that under the now-current exemption level, only a tiny handful of small farms were likely to owe any estate tax to begin with — and of those, only about a dozen lacked the assets to pay their taxes. And even those dozen had 14 years to pay the bill as long as the kids kept running the farm. In other words, the story was a fraud from beginning to end. My correspondent wants an evidence-based response to this, so let’s give him one. Step 1: The biggest part of Obama’s plan is to let the Bush tax cuts for the rich expire. 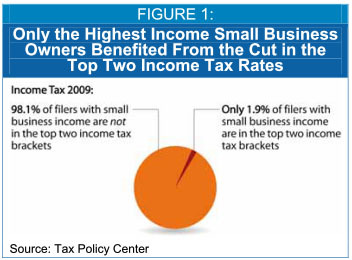 The Brookings Tax Policy Center took a look at this last year and estimated that only 1.9% of small businesses are in the two top brackets that would be affected by repeal of the Bush tax cuts. That’s a little better than the dozen small farms affected by the estate tax, but not by much. Step 2: About half of that 1.9% aren’t really small business owners at all. They’re high-income investors who get part of their income from investments in small businesses. So we’re down to about 1% of small businesses that would be affected. Step 3: The top brackets are just that: brackets. When the top rate goes up, it doesn’t affect your entire income, just the portion in the top bracket. So if the top rate goes back up from 35% to 39.6%, it only affects the portion of income above approximately $400,000. A small business owner making $500,000 would see an increase of about $5,000. This is a fairly modest amount for someone making a half million dollars, and anything higher than that is hardly a “small” business to begin with. And the marginal effect is even smaller for the second-highest bracket. And the proposed “millionaire’s tax” would — of course — affect only people making more than a million dollars. So that’s the case. Raising taxes on the rich at the level Obama is talking about affects only a tiny number of small businesses; it doesn’t affect them very much; and it generates revenues of several hundred billion dollars. If the only thing you care about is keeping taxes low for rich people, you won’t be convinced. For the rest of us, it’s a no-brainer.